A rim joist is the area of your home where your floors and walls come together on the foundation. This area is located under your sub-floor and is the outer most wooden structure in your home. Since rim joists sit on top of the foundation it is exposed to the outside elements and in most cases is the number one cause of air infiltration. As a result, air sealing your rim joists is one of the best things that you can do to reduce your energy bills and make your home more energy efficient. This area of your home is the easiest area to insulate and will provide you with the biggest return on your investment. Professionally applied spray foam insulation is considered by far to be the best way to air seal your home's rim joists. The expanding foam will seep into cracks and cerevisiaes that other types of insulation simply can not. Most home builders just stuff fiberglass insulation into these areas which provide some thermal boundary but do little to stop air infiltration which is the main cause of energy loss. Since fiberglass insulation allows air to easily pass through, it is a very poor choice for insulating these draft areas. Filling the entire rim joist cavity with spray foam can be costly so some home owners prefer to use a method know as a flash and batt. This method allows you to capitalize on the air sealing benefits of spray foam while reducing the amount of foam needed to create a good thermal boundary in the space. To accomplish this, a BPI certified insulation contractor would install a two inch layer of spray foam insulation to the area, followed by fiberglass insulation. 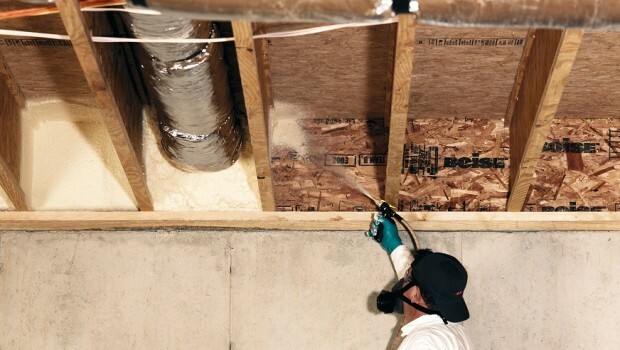 In this instance, the spray foam insulation would stop the air leaking into your home and eliminate condensation while the fiberglass batt insulation would increase your thermal barrier. To find out more information about rim joist air sealing please request an estimate using the button below.